감은사는 동해안에 있는 통일신라시대의 사찰로 지금은 3층석탑 2기와 금당 및 강당 등 건물터만 남아있다. 신라 문무왕은 삼국을 통일한 후 부처의 힘을 빌어 왜구의 침입을 막고자 이곳에 절을 세웠다. 절이 다 지어지기 전에 왕이 죽자, 그 뜻을 이어받아 아들인 신문왕이 682년에 완성하였다. 문무왕은 “내가 죽으면 바다의 용이 되어 나라를 지키고자 하니 화장하여 동해에 장사지낼 것”을 유언하였는데, 그 뜻을 받들어 장사한 곳이 절 부근의 대왕암이며, 그 은혜에 감사한다는 뜻으로 절 이름을 감은사(感恩寺)라 하였다고 전한다. 발굴조사를 통하여 강당·금당·중문이 일직선상에 배치되어 있고, 금당 앞에는 동·서쪽에 두 탑을 대칭적으로 세웠음을 밝혔다. 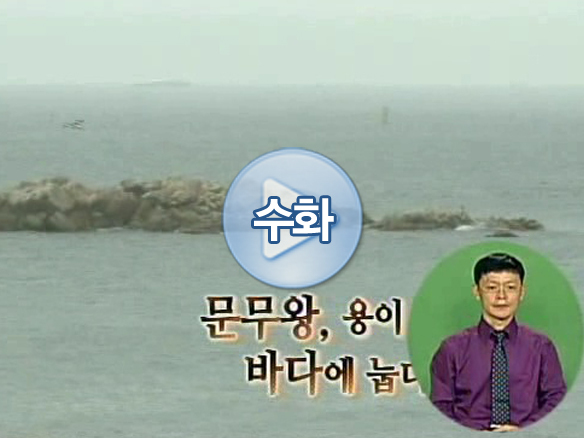 이 건물들은 모두 회랑으로 둘러져 있는데, 이러한 배치는 통일신라의 전형적인 것이라 할 수 있다. 금당의 지하에는 배수시설이 있는데, 전설에 의하면 죽은 문무왕이 바다용이 되어 이 시설을 통해 왕래하였다고 전해진다. 금당 앞의 탑 2기는 우리나라의 석탑 가운데 가장 큰 것으로, 석탑의 모범이 되고 있다. 감은사는 황룡사, 사천왕사와 함께 나라를 보호하는 호국사찰로 알려져 있으며, 언제 절이 무너졌는지는 밝혀지지 않고 있다. 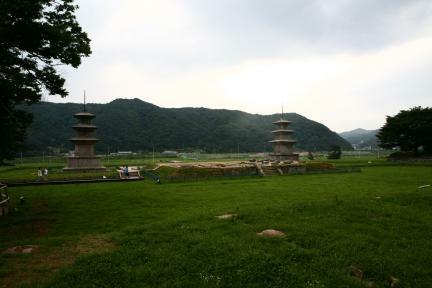 Located on the East Coast, Gameunsa Temple was built during the Unified Silla Period and is home to two three-storied stone pagodas. 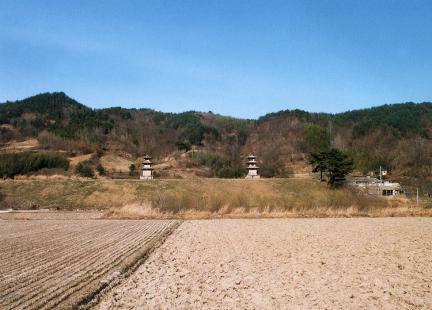 The construction of Gameunsa Temple was initiated by King Munmu, the 30th king of the Silla Dynasty. 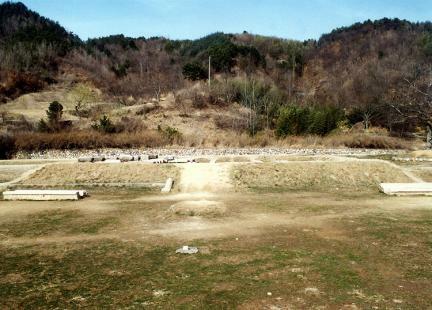 After unifying the Three Dynasties, King Munmu wished to secure the divine aid of Buddha to resist Japanese invaders, so he ordered the temple constructed. 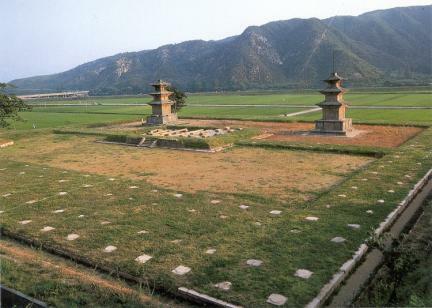 Unfortunately, he died before its completion, and his son, King Sinmun, took over the work that was finished in 682, the second year of his reign. 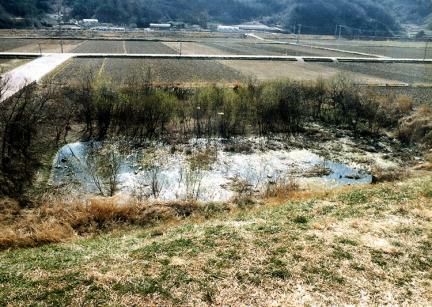 Since King Munmu had once expressed the wish to become a sea dragon to protect his country even after his death, his body was cremated and buried in the underwater tomb of Daewangam. 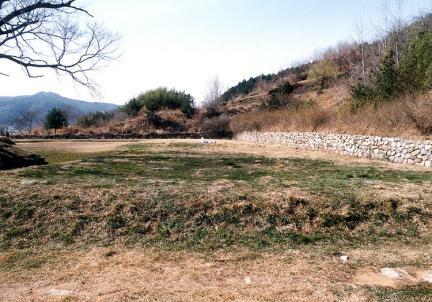 The name of the temple, Gameunsa, signifies the gratitude of King Sinmun toward his father, King Munmu. Two years of extensive excavations and restorations have resulted in what is now a visible site. 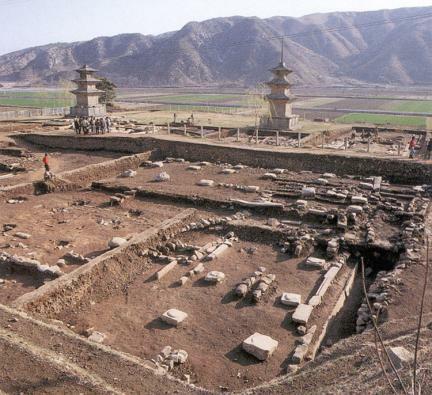 A special structure interpreted as the symbolic resting palace of King Munmu and a connecting tunnel to the East Sea have been uncovered, too. The excavation work also revealed that the temple consisted of a lecture hall, a main prayer hall, and the middle gate, all surrounded by the gallery buildings. 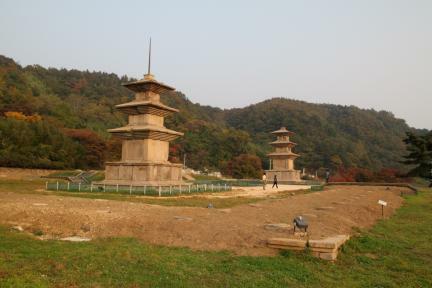 The twin three-story pagodas were built around the beginning of the Silla Dynasty and are thought to be the biggest of the Silla pagodas. 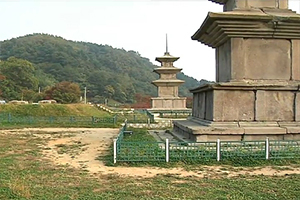 Along with Hwangnyongsa Temple and Sacheonwangsa Temple, Gameunsa Temple is believed to have been built to protect the nation. It is not known when and how the temple disappeared, however.